Thank you for your interest in #WeTheExplorers. Submissions are closed. You. All ages and skill levels are welcome, but minors (under 18) must have permission of a parent or guardian to participate. Your submission may take the form of a sketch, photograph, graphic, poem, song, short video or other creative or artistic expression. The deadline for submissions is Sunday, March 20, 2016 at 11:59 pm PDT or when capacity of the drive that will carry submissions to space is reached, whichever occurs first. Your submission must be posted—and correctly tagged—before this deadline and must remain accessible on the platform until at least April 30, 2016. 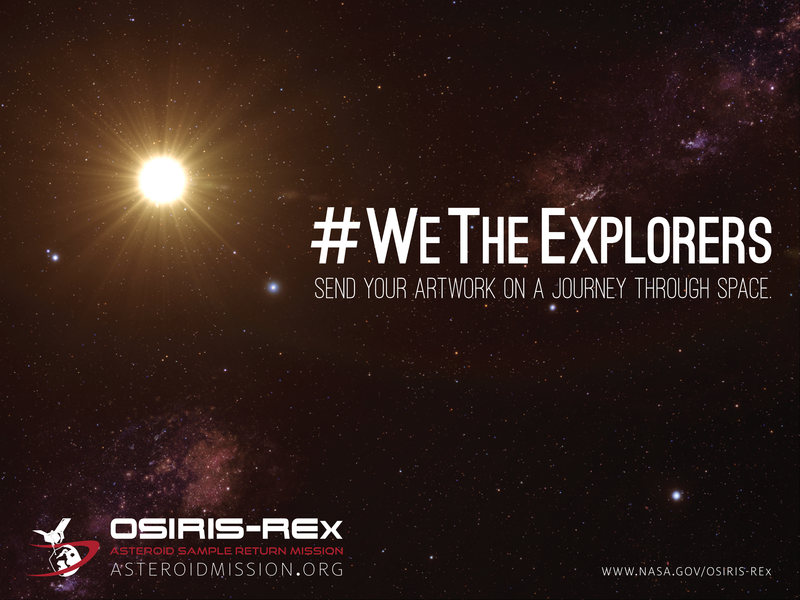 Share your contribution by tagging us on Twitter (@OSIRISREx) or Instagram (@OSIRIS_REX) and including the hashtag #WeTheExplorers. Please ensure the settings on your account allow your submission to be viewed without a password. Videos may be submitted by direct upload to Twitter or Instagram or by including a link to your YouTube or Vimeo video in a correctly tagged tweet. Video submissions are limited to 2 minutes and 30 seconds in length. If your video is hosted on Vimeo, please ensure you check the box allowing it to be downloaded. Learn more about the mission and its two stars: the spacecraft OSIRIS-REx and the asteroid Bennu.